Sweet and delicious cinnamon rolls filled with cinnamon and brown sugar and topped with a vanilla and honey glaze. I love cinnamon rolls and I like them to fill my whole hand, be filled with flavor, and I want them covered with a delicious sweet glaze. These honey cinnamon rolls are indulgent because of the warming flavors of brown sugar and cinnamon and the sweet flavors of honey and vanilla. Serve the honey cinnamon rolls with a serving of cold milk and you’ll be in Heaven. It’s important to make sure your yeast is alive and active or these cinnamon rolls will be a huge failure. They dough be sticky, not doughy, will not rise, and they will not bake right. It’s also important to use lukewarm water for this recipe because using milk too hot will kill the yeast and using milk too cold will not activate the yeast. I always heat the cup of milk in the microwave in small increments and stir it once it’s out of the microwave. I dip my finger into the milk to check how hot it is before I add my yeast and sugar to the mixture. Allow 5 minutes for the yeast to get bubbly and foamy. If it does not get bubbly, then your yeast did not activate – simply start over with new yeast. After adding the other dough ingredients into the mixture, then make sure to work the dough into a ball and work it until the dough is no longer sticky when touched. Allow the dough to sit for an hour and allow it to double in size. Proofing the Dough in the Pressure Cooker! Pressure cookers aren’t just for pressure cooking food! They also work to speed up the process of proofing dough! I put my dough onto parchment paper, place it down in the pot on the trivet and place a plate on top of the pot. I press my yogurt butter and set it 30 minutes. Voila! The dough has proofed in half the time the traditional way! It’s also a great way to proof dough if your house is cool and drafty. I don’t like to chance my dough sticking so I always take preventive measures to ensure everything goes smooth. I lay a piece of parchment paper on my table, sprinkle it with a small amount of cornstarch. I place my dough ball on the parchment paper, sprinkle with another small amount of cornstarch and then I roll my dough out into a long rectangular shape. Once that is done, I spread my cinnamon filling and spread it out evenly. I leave about an inch of the dough untouched by the filling. I then roll the dough up starting at the short side of the dough. A very useful tip is to use floss to cut your cinnamon rolls, this helps them keep their shape and the floss slices right through! If you don’t have any floss on hand, you can also use a pizza cutter but you may need to reshape your dough back into a circular shape. I always lightly grease my 13×9 baking dish before I add my cinnamon rolls. It makes them easier to remove because you don’t have to worry about them sticking! If you want your Honey Cinnamon Rolls to be tall and fluffy, make sure they’re touching when placing them into the baking dish. This will force them to push up instead of out… don’t worry, they’ll still be huge! After I allow the cinnamon rolls to cool for at least 5 minutes, I add the honey vanilla glaze. I always make sure that the cinnamon rolls are cool to the touch so that the glaze doesn’t melt down in the rolls but instead glazes the tops and spreads smoothly. If you want to warm these delicious cinnamon rolls back up, it’s really simple. Pop these delicious treats into the microwave for about 15 seconds. 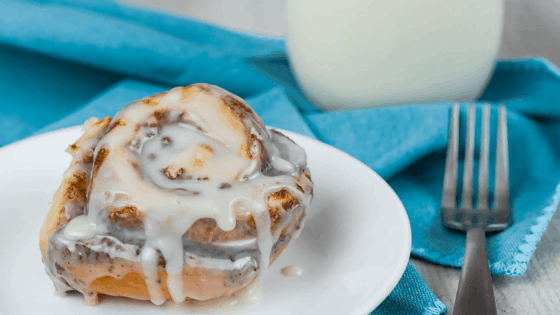 You’ll have a deliciously sweet and sticky cinnamon roll in a matter of seconds! In a large bowl, combine the yeast, lukewarm water, and 2 tsp of sugar. Mix together well and let sit for 5 minutes. It will become foamy if the yeast is alive! Once the yeast has been activated and is foamy, add in the eggs, softened butter, sugar, and salt. Using a dough hook, slowly start adding in the 4 1/4 cups of flour. The dough is ready when it bounces back when touched and is well combined and not sticky. Melt the 4 tbsp of butter in a heatproof bowl. Add in the 1 cup of brown sugar and the 3 tbsp of cinnamon. Mix well until it is all combined. After it is rolled out into a rectangular shape, spoon out the cinnamon filling mixture over the dough, spreading it to be about an inch away from all sides. Starting from the shortest side, roll the dough until it is completely rolled. Using floss slice into 12 rolls (about 1" to 1 1/2" thick). Place in greased dish with sides touching. Allow rising for about 30 minutes. Bake in preheated oven for about 20 minutes - until the tops are slightly browned and they're not doughy. Remove from oven and allow to cool 5 minutes before pouring on glaze. Prepare glaze but mixing the 2 cups of confectioner's sugar, 4 tbsp of milk, 1 tsp of vanilla, and 1 tsp of honey. Mixed until well blended. If the glaze is a tad too thick add 1 tbsp of milk at a time. Drizzle the glaze over top of the cinnamon rolls after they have cooled for at least 5 minutes.